With winter fast approaching, I can't help but think of how badly my coat closet needs an update. It's been a very long time since I've invested in coats, and even though I have a good amount, I truly am over most of them and itching for new fresh classic styles that will inspire me to be chic while keeping warm this winter. You see, when you're from a very cold state, most of the time when you go shopping for coats, you're thinking of which coat is going to keep me warm on those high whipping wintry cold mornings that are in the teens. Unless Eskimo chic is a new style (where you are so bundled up that if you got pushed over you would not be able to get up) it is difficult to find stylish coats thick or heavy enough to do the job of keeping you warm. Thankfully, I'm going to be away from those biting blistery days for a while, which gives me the opportunity to finally break away from the heavy "practical" coats, being bundled up completely like a sumo wrestler say... and grab some cute chic ones. I love how the leather trim gives that little bit of edge without feeling over the top. Each one (ALL) would be a perfect addition to bringing my coat closet up-to-date. Time to do some shopping! SheInside: black contrast leather trims oblique zipper coat. Right now, if you spend a $100 you get to save 20% off, using code: Christmas100. SheInside: Grey contrast leather quilter sleeve coat. 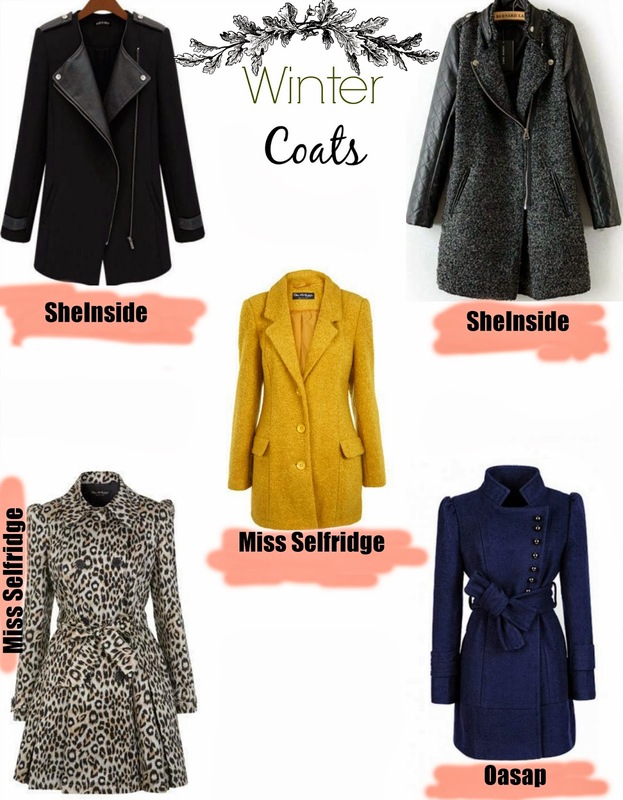 MissSelfridge: yellow wool single breasted coat adds that pop of color on those occasional grey days. MissSelfridge: You can never go wrong with a leopard print coat. Animal prints are now the new neutral in fashion and a classic. Always have an animal print for whenever your 'Sasha fierce' alter ego is ready to take on the streets. Oasap: I'm so bummed that this single breasted Oasap wool coat is sold out (boo), but this great vintage faux fur one would be just as chic and right up my alley. Still hoping more of the Oasap coats become available. Another favorite on the list is this one.